MAGICAL POWDERS, HERBS, ROOTS & BARKS (Rare and Unusual) Here is a genuine collection of rare and unusual roots and herbs, highly prized by collectors and practitioners. Includes usage and lore on the back of the pack. Many of these botanicals are difficult to obtain, let us help you find what you need........Secure On-line ordering. The Realm Of White Magic - Specialists in magical supplies since 1989. Here is a genuine collection of rare and unusual roots and herbs, highly prized by collectors and practitioners. They come with information about usage and lore on the back of the pack. Our NEW packaging features MORE INFORMATION on each Herb such as GENDER, ELEMENT, PLANET, FOLK NAMES, BOTANICAL NAMES and More! Many of these botanicals are difficult to obtain in Australia. We are proud to offer you some of the most sought after botanicals from around the world. You will find Sandalwood Chips and Powder, Frankincense and Myrrh Powders included in this section as well. Anything not listed, please ask, we may be able to get it for you. See our full range of Empty Bottles, Jars and Accessories. These roots are very special and sought after. Used to win the one you desire. They are used in pairs. 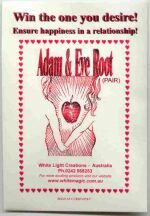 If a woman wishes to attract a certain man, she gives him an Adam root and if a man desires to attract a certain woman, he gives her an Eve root. Husbands and wives can exchange these roots in the same manner, thus insuring their fidelity. Annoint root with 'Come To Me Oil' and carry in a red flannel bag. Click here to order red bag. Protection, Sleep and Psychic Healing. 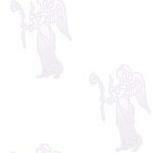 Use in protection spells to banish negative energies. It is believed this herb not only breaks hexes and curses but turns them back on the sender. To enhance an 'absent' psychic healing, burn some as an incense whilst conducting the healing. Place under pillow to aid sleep and calm emotions. Use in any money spell or divination ritual. Add to money or divination incenses. Carry some (wrapped in green cloth) on your person to attract money towards you. To enhance clairvoyant powers put some (wrapped in yellow cloth) in your pocket when practising any kind of divination, finding lost objects or discovering buried treasures. Also known as Golden Rod. Burn small amounts in exorcism and protection incenses. Destroys manifestations of spirits if thrown onto a fire or into a censer during magical rites. Asafoetida has a powerful smell, so use with care. Sprinkle a small amount in the four corners of your home to ward off evil. Add to healing, protection and exorcism incenses. Believed to remove curses and spells when added to bathwater. The leaves can cause visions when smoked. Also known as Angelica Root or Masterwort. To clear an area of troublesome forces and negativity, place some crystals in a dish and put the dish in the effected area. Use more than one dish if it is large area. Replace weekly and dispose of crystals in running water. (sea or river) ****Now Available in larger 30gm packs! Believed to posses high spiritual vibrations, this herb is very rare and difficult to obtain. Throughout the ages is has been added to incenses and formulas in the belief that it has potent strengthening powers. A small amount carried on the person is believed to attract love. Also known as Lignum Aloes. To Repel Negativity In Troubled Areas. Sprinkle across doorways and in the corners of the room to absorb and repel negativity. This rare and sought after herb is believed to be very potent for love. Said to mend a broken heart, and attract a new love when carried on the person. It is also carried to attract protective and healing vibrations. Love, Relationships, Commitment, Communication, Protection and Lunar Magick. Carry on the person to attract love and good communication. Add to incenses to protect from problem people and remove obstacles. Said to gain commitment from your partner when placed secretly in their pocket/purse or on their person. A good herb to use for Lunar Magick. Also known as Cleavers. Betony has a long established reputation as being very powerful in it's ability to protect someone against dark forces and negative energy. Carry some on your person for protection and/or scatter at the four corners of a room or house to banish negative forces. When burnt by itself it is believed that the smoke will purify the body. Carried on your person it is also said to attract love advances. Favoured by the Druids, it is an excellent herb for magickal healing and work on the elements. As seen in Australian Witchcraft Magazine, Issue No. 3. Worn to attract a lover. It is placed in the bedroom and added to baths for lust. It is believed that when Black Snake Root is carried in the pocket or purse it will attract money towards you. Also known as Black Cohosh. Protection, Purification, Healing and Earth Magick. Add to protection incenses and spells and carry on your person for protection against negativity. Burn to cleanse and purify a room or place, cast around the home to ward off negative forces. Boil in water, cool and then sprinkle on oneself. It is believed this will rid you of negative feelings towards yourself and others. CINQUEFOIL - see Five Finger Grass "Magical Herbs with a Free Crystal" Page or Click to Order. CATNIP - see our "Magical Herbs with a Free Crystal" Page or Click to Order. Burn as an incense to help you to see the future. Use in spells of peace and tranquility. Caution - It is said that, smoking this herb can cause visions. Add to love sachets to increase their power. Luck, Healing, Money and Protection. It is believed that a small quantity of Calamus in each corner of the kitchen will protect the occupants from hunger and poverty. Used to bind and strengthen spells. Add to healing incense. Growing Calamus is said to be lucky. Also known as Sweet Flag. Remove Obstacles, Gain Favours and Invisibility. Chicory can be burned as an incense. It is a good herb to use when one is seeking to remove negativity and obstacles from their path. It can also be used in healing and magick to promote a more positive outlook on life and to improve one's sense of humour. Anointing the body with a tea made from Chicory is said to bring favours from others. It was once thought to make the possessor invisible, open locked doors and boxes if harvested in the correct magickal way. DAMIANA - see our "Magical Herbs with a Free Crystal" Page or Click to Order. This much sought after root is very potent. Carried in your pocket or purse, it is said to ward off evil. Gamblers carry it as a good luck charm. Carry in the pocket while seeking employment. A special blend made especially for sprinkling or dusting. Sprinkle this powder in your shoes, on documents, around the home, in your purse and over annointed candles. Add very small amounts to other incenses to increase their potency. Not suitable to burn on charcoal on its own - see Dragons Blood Chunks. Pure Dragon's Blood Gum. Burn as an incense for uncrossing, removing curses and hexes. Add to other incenses to increase their potency. Why not try our Dragon's Blood Incense Sticks or Oil. Use with our Dragons Blood Luxury SOAP. Dispel Anger, Clairvoyance, Fairy Magick. Said to dispel violent, angry vibrations when placed throughout the house. Believed to prevent sickness when sprinkled on clothes. Smouldered on charcoal is said to enhance psychic abilities. Carry in a pink cloth for love and a blue cloth for protection. Also known as Elfwort. Clairvoyance, Memory, Truth Seeking, Meditation. Known as 'The Witches Sight Herb' mix with other appropriate herbs for meditating and opening the third eye. Make a simple tea from this herb, cool and rub on the eyelids to enhance clairvoyant visions and 'inner sight'. It is said this is also good for guided visualizations and memory. FIVE FINGER GRASS - see our "Magical Herbs with a Free Crystal" Page or Click to Order. A rare herb, highly prized by magical and medicinal practioners. Sprinkle an infusion of Golden Seal Root around your place of bussiness to increase profits. A favourite healing herb of the American Indians. To enhance the experience and heighten mental stimulation, burn a small amount prior to (but not during....) mediation visualizations, mind power exercises, magick and rituals. Also known as Pennywort. Wishing, Love and Overcome Difficulties. Used in rituals to attract a mate, carry in a red mojo bag. Hold some Guinea Pepper in your hands, make a wish and throw a few grains to each of the four directions. Used to triumph over your enemies. Said to create trouble and strife for your enemies when left on their doorstep. Fertility, Love, Happiness, Banishing, Fishing Magic. Brew the berries as a tea and sprinkle the tea about the premises. It is believed this will expel all evil spirits from the area. Carry some berries in a yellow cloth when fishing. This is said to ensure a good catch. Carry some berries in a pink cloth to bring happiness when feeling depressed, troubled or sad. Also used to attract Faeries. Worn around the neck it is believed to aid in recuperation from illnesses and ward off future health problems. Added to bath water it is believed to break hexes and curse which have been cast against you. Often added to healing and exorcism formulas. Also known as Rue. A very rare and prized herb. Anoint the root with Money Oil and carry in a green sachet/bag to attract money. When carried on the person it is said to eliminate depression and confusion and bring love and success into your life. Gamblers are known to use this root by boiling it in water and using the tea as a hand wash prior to going to the casino. Cleansing, Purification, Healing, Protection and Banishing. Add to bathwater for healing or to purify one's self prior to a ritual. It is claimed that the fragrance of Hyssop increases clairvoyant powers. Placed throughout the home it is said to protect it from burglars and trespassers and also repel negative energies. Known as the 'Holy' herb, Hyssop is said to be the best herb for physical cleaning of a temple, tools, robes etc. Protection, Anti-theft, Exorcism, Love and Health. Carry before any sexual encouters to increase potency. Carry in a Mojo bag to attract money. Juniper Berries are often used to make amulets by threading the berries onto a necklace and worn for protection, love and good health. It is believed that the 'tears' strung onto a necklace and placed around a child's neck will aid in teething. Worn by adults it is said to aleviate sore throats and colds. The ancients believed that the 'tears' absorbed pain and illness. Three 'tears:' can be carried for good luck. For wishing magic hold the seven 'tears' as you concentrate on your wish and carry with you. Repeat each day. Very rare and very potent! 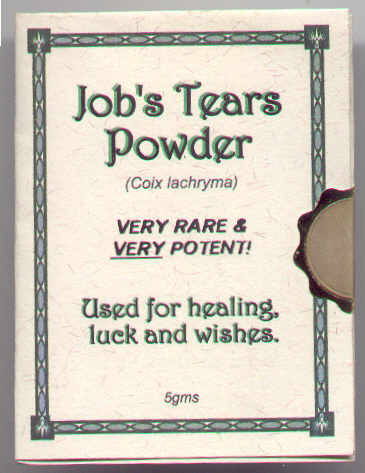 This special Jobs Tears Powder comes in a parchment pack with gold seal. Includes instructions and information. Use the powder in magickal incense blends, herbal mixtures, annoint candles or in mojo bags. Sprinkle the powder where needed. Traditionally used by Islanders of the South Pacific, Kava is used for seeking visions, luck and protection. Also known as Intoxicating Pepper. Pour contents into a muslin bag or the centre of a muslin cloth. Wrap into a tight ball and immerse in 3 litres of water, squeezing to release the Kava until liquid is cloudy. Continue depending on strength desired. Use only under adult supervision. Note: No Alcohol should be consumed either before or after drinking Kava - Use in moderation - may cause drowsiness. ** Stop Press!! - June 2007 Australian Government has imposed import restrictions on Kava into Australia. The new price is a reflection of our suppliers updated price and availability. Long revered by the ancients as a mystical symbol of life, spirituality and the centre of the universe. Used in protection and love spells and when carried on the person it is believed to ensure blessings by the Gods and good luck. Discover our Lotus Luxury SOAP. Protection, Spell Breaker, Lust and Health. Worn or carried, it is said to protect the bearer, guard their health and bring good luck. Add to incense to help break spells and curses. To promote lust, sprinkle the powder around the home or put some pieces of the root under the mattress. Also known as Galangal Root. Worn or carried it is said to protect the bearer, guard their health and bring good luck. Aids psychic development. The powder is burned to break spells and curses and sprinkled around the home to promote lust. Also known as Galangal. One of the most sought after magical botanicals. Carried on the person for luck and general success. A charm to obtain and maintain employment and secure protection from all ills. If you need love - wear it near your heart, if you wish to travel - place it in your shoe, if you need money - carry one in your wallet/purse. It is said that this root when carried on the person, makes a man more virile and a woman more fertile. It is believed that a piece of the root hung high in the house will give protection and prosperity to the home. Many believe that a piece of this root kept with one's money will make it grow. Also known as American Mandrake. 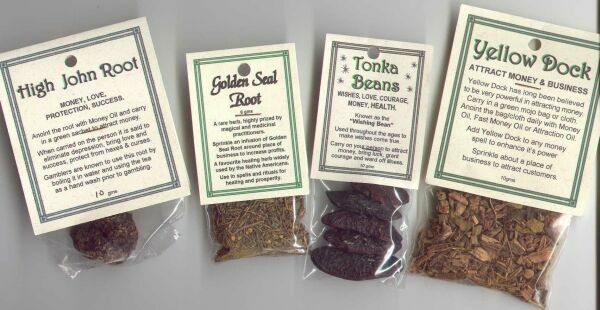 Click here to discover Mandrake Incense Sticks or Mandrake Oil. MEADOWSWEET - see our "Magical Herbs with a Free Crystal" Page or Click to Order. MUGWORT - see our "Magical Herbs with a Free Crystal" Page or Click to Order. Mistletoe is a sacred plant to the ancient Druids and Romans, who believed it could cure illness, ensure fertility and protect against evil. It is believed that Mistletoe bestows love, good will and friendships. 'Exchanging a kiss' under Mistletoe signifies good will & a promise to marry. PASSIONFLOWER - see our "Magical Herbs with a Free Crystal" Page or Click to Order. PATCHOULY LEAF - see our "Magical Herbs with a Free Crystal" Page or Click to Order. Purification, Healing, Sleep, Love, Psychic Awareness. Burn in a new home to clear out negative sickness energies. In a healing ritual, place on the person or their picture to help hasten the healing process. Add to psychic incenses to enhance psychic awareness and visions. Carry with other herbs to boost love and abundance. Love, Passion, Love Dreams, Romance, Friendship, Peace and Happiness. Place under pillow to dream of love. To preserve love, grind some Quassia bark, mix with some hair from a loved one and follow the instructions on the pack. Add to love mixtures to draw and maintain love. It is believed that an infusion of Rattlesnake Root added to the bath water and used in the rinse water for clothing, offers protection from others trying to harm you. Also, it is said that rubbing the infusion on hands and feet will lead you to money. Burn Sage to strengthen the ability to memorize and to tone the conscious mind. Use in protection and money spells. Crush Sage between your fingers. As you do this visualize money and prosperity manifesting in your life. Carry Sage to attract material gains and to promote wisdom. Featuring MORE INFORMATION on each pack such as GENDER, ELEMENT, PLANET, FOLK NAMES, BOTANICAL NAMES and More! Lust, Passion, Sexuality, Power, Vitality and Money. Add these berries to any incense, spell or charm bag concerning the above. Carry some berries in a red cloth when seeking a night of 'hot' passion. Carry some berries in a pink cloth when seeking romance and carry in a green cloth when seeking money and good fortune. It is believed that a woman who wears Scullcap, protects her husband against the charms of other women. It is sprinkled around the house to bring peaceful vibrations. When carried it is said to help you to relax in times of stress. Use this powerful powder with caution. Added to incense for exorcism and protection rituals to intensify their power. In magical rites it is said to destroy manifestations of spirits if thrown onto a fire. Clarity, Fidelity, Health, Good Luck. Another very sought after botanical. When placed in an open container next to you when studying, it is said to increase mental clarity and concentration. Anointing a photo of a loved one with a tea made from Spikenard is said to insure their fidelity. ST. JOHNS WORT - see our "Magical Herbs with a Free Crystal" Page or Click to Order. Use in Love spells for lust. Place under a pillow or mattress to rouse lust. This herb is associated with beauty, sexual appeal and protection. Used in ritual to represent a promise to be faithful and can be used in ritual baths in preparation for a Handfasting or ritual of union. Burn as an incense to guard against all kinds of trouble. Known as the 'Wishing Bean'. Used throughout the ages to make wishes come true. Carried to attract money, bring luck, grant courage and ward off illness. Used to make wishes come true. Calming, Sleep, Love, Romance, Purification. Placed inside a pillow is said to aid sleep. Calming and purifying in matters of love. Said to help quarrelling couples get back together again. Carry in a red mojo bag or use in spells of love. Sometimes used as 'graveyard dirt' when powdered. VERVAIN - see our "Magical Herbs with a Free Crystal" Page or Click to Order. Psychic Powers, Protection, Success, Calling Spirits. Carry on thy self to aid developing psychic powers. Hung from the rear view mirror it is said to protect the vehicle from accidents. Mix with Sandalwood and burn to summon spirits. White Sage is also known as �Grandfather Sage� - the sacred herb to the Native American culture. Add to healing and purifying incenses or burn White Sage leaves on incense charcoal to cleanse an area. Discover our White Sage Luxury SOAP. Happiness, Love, Lust and Exorcism. Carried on the person and sprinkled under the bed it is said to attract new lovers. Used often in unhexing and uncrossing rituals. Make an infusion and sprinkle around troubled areas to disperse negative forces. YARROW - see our "Magical Herbs with a Free Crystal" Page or Click to Order. YERBA MATE - see our "Magical Herbs with a Free Crystal" Page or Click to Order. Sprinkle about your place of business to attract customers. Believed to help a woman conceive a child when tied around her left arm. Used in money spells. $53.00 per 20 Assorted - You Save! Looking for a small quantity of an unusual herb which you need to complete a recipe for incense, spell or ritual. Here is a collection of very sought after herbs in small packs (approx 5 gms per pack). Every pack includes key words indicating the magickal powers attributed to each herb. These mini herb packs are valued at $3.10 per pack. A random selection of the following herbs and many more can be found in our starter packs. Angelica, Bayberry Bark, Betel Nut, American Mandrake, Black Cohosh, Buckeye, Calamus, Damiana, Elder, Elecampane, Eye Bright, Globe Amarinth, Herb of Grace, Heartease, Hyssop, Jasmine, Lavender, Lemon Balm, Lime Flowers, Lobelia, Mace, Mistletoe, Meadowsweet, Motherwort, Mullien, Muira Puama, Pennyroyal, Quassia Chips, Queen Of The Meadows, Raspberry, Red Clover, Red Sage, Rue, Sasperilla, Scullcap, Senna Leaves, Uva Ursi, Vervain, Wood Betony, Wormwood and more. The finest Sandalwood Powder for burning on charcoal or mixing with other incense to increase potency. For more Sandalwood see our Incense Sticks and Granular Incense. Discover Nag Champa Sandalwood Soap and Royal Sandalwood Luxury SOAP. Natural sandalwood chips for burning on charcoal, potpourri or mixing with other incense. Click here to discover Frankincense Granular Incense and 1 Kilo Bulk. Click here to discover Myrrh Granular Incense. Click here to discover Frankincense & Myrrh Granular Incense. Mix some of this powder with your incense to make a self igniting mixture. It is believed to increase the power and it will also make your incense burn much better and it will be less inclined to go out. Be careful it is highly flammable. KEEP AWAY FROM CHILDREN. Also known as Vesta Powder. To clear your home of negative influences, burn some Brimstone powder on charcoal. Open all windows and door as there will be a lot of smoke and a strong odour, but it believed to be a very effective method of clearing the area. Add a small amount to any exorcism incense to increase power. Often used in exorcism spells and rituals. Also know as Brimstone Powder. LOOKING FOR BULK HERBS EMAIL US FOR A QUOTE. At The Realm Of White Magic, we have a large collection of botanicals, so please Email with any special requirements. If we don't have what you want, we will do our best to find it for you. Send your email address for instructions on How To Make A Herbal Protection Sachet - it will be mailed straight to you. Enjoy using this free service with our compliments! Enter your email address above, and press the send button.